Be the first to share your favorite memory, photo or story of Edith. This memorial page is dedicated for family, friends and future generations to celebrate the life of their loved one. 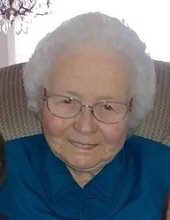 STABEL, Edith Erika -- Age 88, of Swartz Creek, died February 6, 2019. Funeral services will be held 11AM Monday, February 11 at Elms Road Church of God, 2393 S. Elms Road, Swartz Creek. Pastor David Goertzen officiating. Burial in Crestwood Cemetery, Grand Blanc. Visitation will be held 2PM-5:30PM Sunday at Sharp Funeral Homes, Fenton Chapel, 1000 Silver Lake Road, Fenton. Those desiring may make contributions to Elms Road Church of God. Edith was born August 24, 1930 in Poland, the daughter of the late Rudolf and Aline (Bokrandt) Jaeger. She married Frank Stabel on February 14, 1958 in Flint. He preceded her in death on July 6, 1994. Edith was a member of the German Church of God. She loved flowers and gardening and cooking. She enjoyed talking on the phone. She is survived by her 3 sons, Bernie Stabel of Swartz Creek, Robert (Rita) Stabel of Swartz Creek, Gerald Stabel of Zeeland; grandchildren, Ryan (Danelle) Stabel of Grand Blanc, Rachel ( Gabe) Wilcutt of Burton, Angela ( Darren) Holcomb of Rochester and 2 great grandchildren, Sebastian and Ariana. She is also survived by a sister-in-law, Linda Jaeger of Flushing; many nieces and nephews. She was also preceded in death by her sister, Alma Strunk and brother, Arnold Jaeger. Tributes may be shared at www.sharpfuneralhomes.com. To send flowers or a remembrance gift to the family of Edith Erika Stabel, please visit our Tribute Store. "Email Address" would like to share the life celebration of Edith Erika Stabel. Click on the "link" to go to share a favorite memory or leave a condolence message for the family.